Elections in this country are acrimonious. And it does not take an astrologer to predict that the unity government would never be the same if the current trend of mutual recrimination continues. As if recent verbal barbs directed against each other by the lower-rungs of the two main constituent parties of the government are not good enough, President Maithripala Sirisena himself has joined the fray. He told an election rally early this week that the economy would no longer be under the UNP and be handled by a national economic council headed by the president himself after the local government elections. That council though was actually set up in July this year by the President who in a cabinet note proposed that it be functioned as ‘an advisory body on economic policy in the country in order to further strengthen policy coherence in the present consensus government, harness the existing talent of this country for national development and to meet the need for such a national body under the head of the Government in the Presidential Secretariat.’ “The National Economic Council will be a professionally-managed, high-level, national advisory institution reporting directly to the President of Sri Lanka. This body will consist of various divisions in charge of key economic areas related to development plans and priorities of the Government. The NEC will make recommendations to the Cabinet of Ministers on economic policy,” he said in the note. Its first meeting was held on September 12th at the Presidential Secretariat presided over by the President himself. The president will have to invent the time travel to do it again. In the election rally in Kegalle, the President said: “During the past three years, I allowed the UNP to manage the economy. Still people are faced with economic hardships. From this year, I will take the economic management under me to grant people relief,” he said. The President is faced with the same dilemma akin to the one confronted by Angela Merkel, the German Chancellor’s former constituent partners, Social Democrats, whose party leadership understands quite well that an alliance with Ms Markel is the national imperative, but the party’s grassroots want to part ways. The president knows well that the continuation of the current status of the unity government, and economic sanity achieved so far are the best possible way out of the current pressing problems – and to forward his promise of democratic reforms. But, the types of people who fill up those election rallies want to see the blood. Politicians have to live up to their expectations. Though one cannot be blamed for playing to the gallery in Sri Lankan politics, overdoing it could do national harm. The UNP kicked off the whole affair of mutual recrimination. Not happy that the Presidential Commission of Inquiry into the bond scam has called the scam a scam, and also aggrieved that the President choose to make the commission report public, some of the UNP MPs went on a cheap political offensive against the president. The President has since shifted gears; he stormed out of a Cabinet meeting and his remarks in election stages are becoming less conciliatory towards the UNP. If the decline continues, other members will join the fray and it would soon become an all-out dog fight. 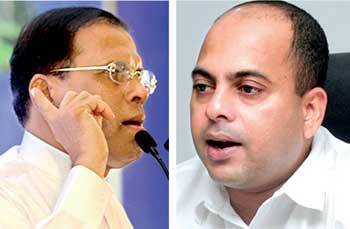 Rancor of the election campaign will outlast the election, and threaten the future of the UNP-SLFP cohabitation. Media tend to predict the collapse of the unity government. That would be news and news sells the papers. Public also like sound-bites and gossip. Sri Lankan voters themselves have rarely voted for growth and prosperity. Sri Lanka’s social and political structures which enable a higher rate of political mobilization in a system of lower social and economic achievement, tend to promote more confrontation than cooperation. Set against that backdrop, the three years of the unity government itself is an achievement. Political stability and a sound pro-growth economic policy matters to the country more than most other earthly premises. Crashing that prospect down, knowingly or unknowingly by playing to the gallery is shame.